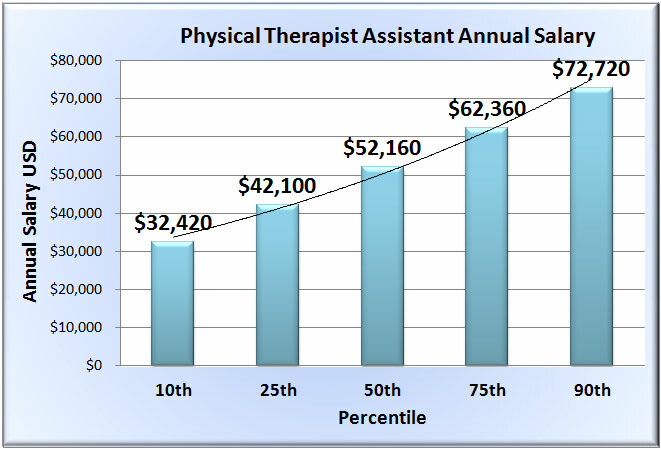 On average, a physical therapy assistant makes $52,320 each year, and the pay per hour is about $25.15. 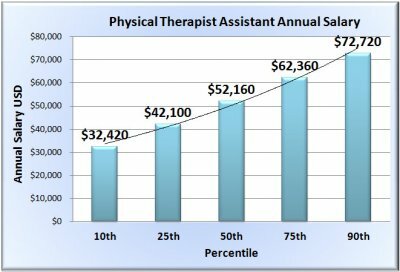 The highest paid physical therapy assistants, falling in the top 10 percent, earn $72,720 per year, and the lowest 10 percent earn $32,420 per year. Top paying industries for this occupation are home health care services, nursing care facilities and retirement community services. Cities with high paying physical therapy assistant positions include Lakeland-Winter Haven, FL ($77,230), San Antonio-New Braunfels, TX ($75,840), McAllen-Edinburg-Mission, TX ($75,490), Modesto, CA ($72,310) and Victoria, TX ($71,700). Physical therapy assistants may be offered bonuses of up to $1,025. The number of physical therapy assistants estimated to be working in 2012 was 69,810. Most are employed in the offices of health practitioners and hospitals. Physical therapy assistants can also be found working in nursing homes and home healthcare facilities. It is predicted that the employment rate of physical therapy assistants will rise by 41 percent between 2012 and 2022, significantly higher than the total rate for all occupations.